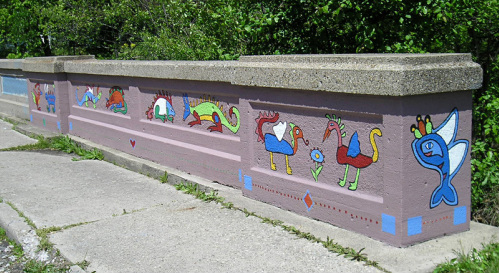 Working with children to create public art in their community has shown me the excitement, pride, and ownership they find in affecting their surroundings, and their world. Often, the appreciation and amazement coming from the community have been a great reward for all participants. Besides school and library walls - tagged bridges, crumbling retaining walls, and boards covering broken windows have been some of our projects at sites ranging from schools, parks, and community centers, to a homeless shelter in Indianapolis and an orphanage in Guatemala. Following are some of the projects. Fundacion Salvacion, Huehuetenango, Guatemala, 2011. Drawn around posed children and filled with designs based upon traditional weavings of the local Mayan culture, to which many of the children belong. Painted with children age 9-16. 6' X 20'. Villa Street Bridge, south entrance over Pleasant Run, Indianapolis, IN, 2008. 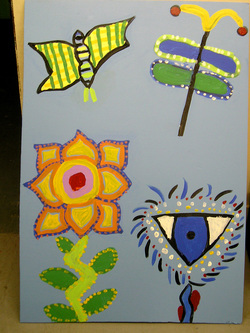 Painted with children age 7-10 from IPS School 20 after-school program. 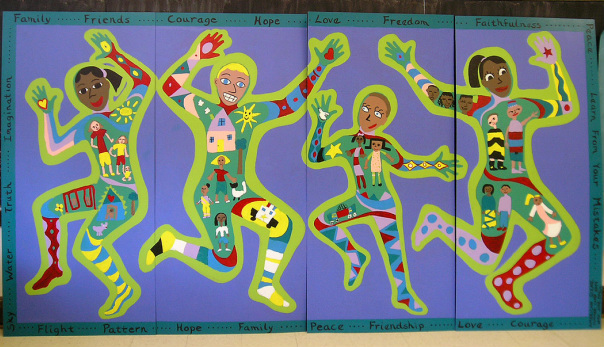 Imagery from children’s paintings inspired by the colorful wood carvings of Oaxaca, Mexico. Each section ~42" high X 25' long. 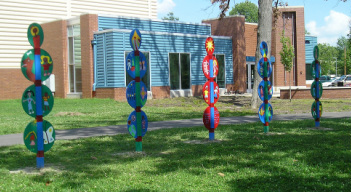 St. Joan of Arc School, Indpls., IN, 2009. Tree of Life, an image involving Mexican history and culture beginning with the Nahuatl of the Aztec Empire. 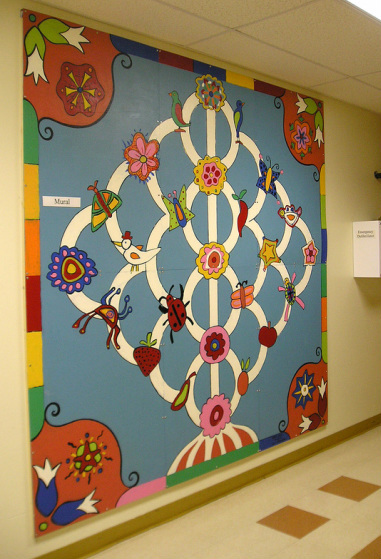 Painted with Latino children age 5-10 in the after-school program at Saint Anthony School, Indpls., IN. 2009, 8’ X 8’. After-school program with children age 7-10. Holy Family Shelter, Indpls., IN. 2009. Mural Project. Acrylic latex paint on luan panels to be installed in the new residential facility being built. Children living in and passing through the homeless shelter made drawings about their sense of home, community, and important things in life. They found connections with African Adinkra symbols and incorporated words and meanings from the tradition. IPS School 88, Indpls., IN. 2004.
framed and hung inside the school. Literacy connection: Students ages 5-11 read the book by Dahl and illustrated parts of the story with clay images. During an evening work session, parent volunteers gridded, painted, and adhered tiles to plywood for mounting. College Park Elementary School, Indpls., IN. 2007. Close-up sections of handmade and glazed clay relief tile. About 600 children age 5-10 created clay nature imagery for their school walls. Windsor Village Park, Indianapolis, IN, 2010. Indpls. Art Center American Scene mural project. Nature Panels East 10th Street United Methodist Church, Indpls., IN. 2007. 6 panels, 4’ X 6’ each. Because ground level windows were repeatedly broken out, it became necessary to cover them with plywood. 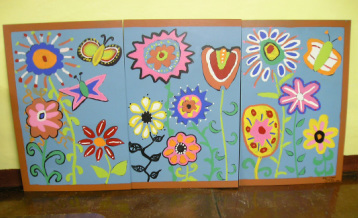 Children painted flower and insect images to replace the outdoor view.